Robometricschool. - After you take Free Download Electronic Software Codevision AVR for Microcontroler Atmel AVR, you must know more information about introduction Codevision AVR compiler now. What is Codevision AVR Compiler? 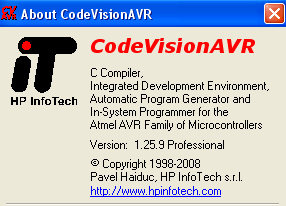 Codevision AVR compiler is a C cross-compiler, Integrated Development Environtment (IDE), and Automatic Program Generator designed for the Atmel microcontroller series made ​​AVR. Codevision AVR can be run on Operating System Windows 95, 98, Me, NT4, 2000 and XP. And Codevision AVR difficult to run on Windows 7 OS. C cross-compiler is able to translate almost all orders of ANSI C language, to the extent permitted by the architecture of the AVR, with the addition of some special features to take advantage of the AVR architecture and the needs of the embedded system. COFF object files compiled the results can be used for debugging purposes at the level of C, with the observation variables, use the Atmel AVR Studio debugger. Why Must Use Codevision AVR Compiler? Codevision AVR compiler has an advantage of others, namely the codewizard, this facility allows us to initialize the microcontroller that will be used. Codevision AVR compiler provide configurations that can be set on each chip microcontroller that will be used, so we do not need to see the datasheet to simply configure the microcontroller. Codevision AVR compiler Using the IDE (Integrated Devvelopment Environment) that easy you to use it. Codevision AVR compiler having the facility to download programs directly from CodeVisionAVR using special hardware such as Atmel STK500, Kanda Systems STK200 + / 300 and other several hardware been defined by CodeVisionaAVR. Codevision AVR compiler having an integrated serial communications terminal in CodeVisionAVR so it can be used to help check the programs that have been created especially using f asilitas USART serial communication. Hope this posting about Lets Study Introduction Codevision AVR Compiler will help you to know more about Codevision AVR Compiler.